Fine ruby specimens. The crystals are from, from left to right, Afghanistan, Vietnam and Tanzania, while the two faceted gems are from Mogok, Burma. (Photo: Harold & Erica Van Pelt). Burma, presently known as Myanmar, is experiencing many changes which will hopefully lead to a resurgence of supply, and therefore demand, for its most precious resource; gemstones. Myanmar has been historically associated with the very finest rubies and jadeites, as well as some of the best sapphire, peridot, spinel and numerous other rare gemstones. However, supply has been limited since Myanmar has managed to keep itself isolated from global affairs for the past three decades. Since our first visit in March of 1993, PaIa International has returned to this enchanted land on numerous occasions to establish more open relations with Myanma Gems Enterprise (MGE), as well as independent miners. We have had the honor of consulting with the Burmese about new techniques for advancing their primary mining and updating their gemological equipment. In turn, we are learning from their traditional and practical experience of gemstone mining. Upon our visits we have managed to purchase a number of exquisite gems and mineral specimens. Our most recent journey to Myanmar in March, 1995, proved that we would be rewarded for the past two years of patience and diligence. We were able to return to the remote mining town of Mogok where the world’s most famous rubies have originated for centuries. After attending the 32nd MGE Gem, Jade, and Pearl Emporium in the capitol of Yangon (formerly Rangoon), we flew north to Mandalay, where our l00 mile (ten hour) cross-country trek by jeep would begin. We were accompanied by two armed guards to protect us from dacoits (the French word for bandits’), which we might encounter on the way. Various insurgents posed less of a threat since our friends are well-known miners in the area. Following is a brief summary of Mogok’s fascinating history and geology, as well as pertinent gemological information. In my experience, Pala International could improve Mogok’s underground primary mining techniques to recover more gemstones by adding mechanization. While, in terms of their goals, Burma’s traditional alluvial mining is quite effective, the most obvious technological advancement that could be introduced to their alluvial mining would be the use of a more technologically efficient riffle system. Many small gems are missed. However, throughout Mogok’s history an entire economy has been supported by allowing individuals to sort through tailings in order to make a living. The improvisation and the intelligence of the local miner is even more impressive since Mogok is quite isolated from any metropolitan center. The Government’s philosophy is for conservation rather than mass production. Although the deputy minister of mines and I discussed mining techniques and the obvious possible technological advances that could dramatically increase production, his belief was that they had been mining for generations and if they brought in too much technology, Mogok could be mined out in a few years. He had visited Kanchanaburi, in Thailand, where they had six large mines employing thousands of people. In only a few years, all that remained was one small mine,with only a few people employed, and ecological problems from large mine waste. He did not feel that was the proper way to mine in Mogok. By continuing traditional methods, people would be employed for many future generations. As I thought about it, the logic was compelling. According to legend, Mogok was originally settled by a gang of bandits banished from Mandalay in the 15th century by the king. They subsequently discovered rubies in the valley and sent them to the king, who in return, pardoned the exiles. Fortunately, they decided to stay and continue searching for more gemstones. 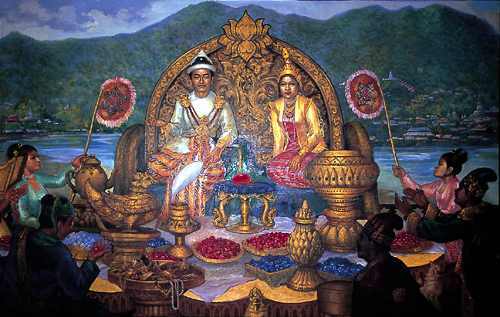 Throughout Mogok’s history, all large rubies were officially the property of the King or the government. This official decree, though punishable by death if broken, is said to have to have resulted in the disappearance of many large rubies (either broken into smaller pieces in order to avoid the decree or hidden for generations). Upper Burma was annexed by the English Empire and placed under India’s rule in 1886. Streeter & Co. of London formed Ruby Mines Ltd. in 1887 and continued official operation in Mogok until 1925. The arrival of commercial quantities of synthetics, World War I, and the Great Depression ultimately forced the British to relinquish control entirely to the Burmese. Through traditional but economically effective methods, practiced for centuries before the arrival of the British, the Burmese diligently continued their quest for gems. This type of mining continued until government nationalization of the region in 1962. Mogok has remained off limits to most visitors for almost three decades. Liberalization of mining in Mogok was initiated by the Myanma Gems Enterprise in 1991, and today there are many joint-venture, as well as independent pendent mining operations, employing more advanced mining techniques and equipment, thereby improving production considerably. However, visits by foreigners to Mogok are not allowed except in special cases, and mining is restricted to Myanma citizens and MGE. The mountains around Mogok trend north-south and are part of the eastern Himalayan orogenic system formed by the collision of the Indian sub-continental plate into the Eurasian continent 4060 million years ago. This tectonic activity was the engine for the resulting regional and contact metamorphism responsible for the ultimate creation of the corundums mined in the mountain valley of Mogok. Simply put, this metamorphism resulted in desilication (removal of SiO2) of the surrounding dolomitic limestone through initial crystallization of diopside = CaMg(SiO3)3 and olivine = Mg2SiO4; then subsequently, spinel = MgAl2O4, thereby allowing for the crystallization of corundum = Al2O3. Trace concentrations of the element chromium (Cr) allow the formation of the ruby variety, while traces of iron (Fe) and/or titanium (Ti) are responsible for blue sapphire. After growth in the mother rock, primary crystals were later transported by water or alluvial erosion to their present placer positions in the valley where they are still being mined today. In the past, mining consisted primarily of removal of overburden by hand to reach the gem rich gravels known as byon. Efforts to expand primary tunnel mining are progressing as demand for more material increases. Myanmar, located in southeast Asia, is bordered by Thailand and Laos in the southeast, China in the northeast, Bangladesh and India in the northwest, and the Bay of Bengal in the southwest. The rainy season, brought by monsoons from the Indian Ocean, starts in May and continues through October, making mining virtually impossible during those months. Mogok lies in the upper Shan Plateau in a mountain valley at approximately 4,000 feet in elevation and is accessible only by jeep or helicopter. Corundum crystallizes in the the trigonal system, usually forming hexagonal blunt prisms (ruby) or steep bipyramid prisms (sapphire). With a hardness of nine on Mohs’ scale, corundum is second only to diamond. Its specific gravity is 4.0, it is doubly refractive and has refractive index readings of 1.7621.770 (0.008). Inclusions are common and often quite valuable in indicating genesis, authenticity, country of origin, and possible treatments. Identifying inclusions are tight clusters of rutile needles, and calcite, apatite, and dolomite crystals. Negative crystals with two-phase inclusions and well formed rutile needles are often found in unheated stones. Spinel crystallizes in the isometric (cubic) system, typically forming octahedral crystals. Its hardness of eight on Mohs’ scale and lack of cleavage make spinel an ideal gemstone. Spinel has a specific gravity 3.60, is singly refractive and has a refractive index of 1.718. Compared to corundum, spinels contain fewer inclusions and therefore provide less information about their origin. Identifying inclusions include concentrations of tiny spinel octahedral and hexagonal crystals of apatite that can assist in distinguishing natural from synthetic spinel. In addition to corundum and spinel, peridot, zircon, moonstone, tourmaline, topaz, diopside, aquamarine, amethyst, danburite and arguably the rarest of all gem minerals, painite, are all found in the Mogok area. Burmese rubies distinguish themselves from most energy response to ultraviolet excitation from natural daylight or incandescent light. 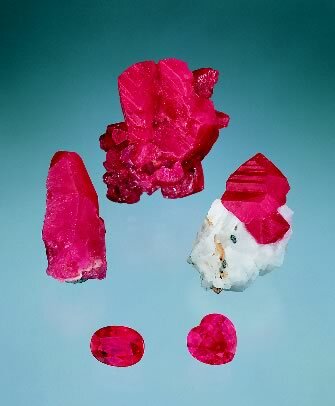 This fluorescence may be attributed to low iron concentrations; the presence of which inhibits fluorescence in other rubies. This vibrant fire from within is a useful selling tool. Gem-quality star rubies are increasingly rare, because high demand for faceted stones is being met by heat treatment in Thailand to remove the silk necessary for asterism. The natural, rich, royal-blue color inherent in most Burmese sapphires, as well as their typically larger sizes, make color and size the primary attributes of this variety. Spinels occur in almost every color of the spectrum although, red, orange and pink are the most prominent hues available. A properly cut spinel will exhibit exceptional brilliance, due to its isotropic nature and relatively high refractive index. Historically, spinels have often been mistaken for fine rubies. Spinel’s high clarity combined with its brilliance and durability make it an ideal gemstone for those looking for an affordable and genuine alternative to corundum. Peridot, found just north of Mogok, represents some of the world’s finest and largest available. Thus, availability in larger sizes and its impressive depth of color are the two main selling points for this gem. Two firsts and one second at this year’s AGTA Cutting Edge Competition! We here at Pala are extremely proud of Meg Berry’s accomplishments in the art of cutting and cutting design. We are lucky here in that we get to see her quality work on a daily basis. Many of you have had the good fortune to have stones cut by Meg, either from our general inventory or by having her custom-cut a stone for you. Most cutters toil away without ever getting the recognition they justly deserve; thus the reason for the Cutting Edge Awards. 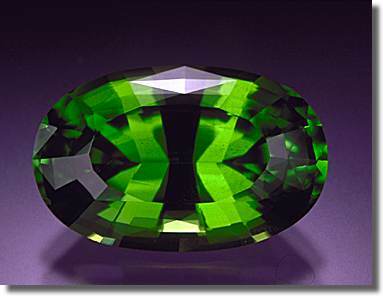 Succeeding in such a competition requires not only advanced technical skills  to achieve optimum shape for the color and species of the material being cut  but also a thorough understanding of the gem itself by being able to see in the rough what most of us only appreciate after the stone is finished. Meg has honed these skills to a professional edge and we congratulate her as well as all the other winners of this year’s competition. From all of your friends & co-workers here at Pala we take our hats off to you on this most special achievement. Within the past two decades, the gem world has been given an unparalleled wealth of material; more than at any other time in history. It seems that the gem world’s interests run in cycles; it’s as if mother nature waits for our interest to wane before enticing us with another gem. With Myanmar very much in the spotlight these days, the interest has come full circle. It’s Tuesday afternoon. I walk into our gem room and glance over to the counter at a tray of some of the most beautiful red I’ve seen in a long time. A second closer look reveals to me that this is some of the breathtaking treasure acquired at this year’s annual Myanma Gem, Jade and Pearl Emporium in Myanmar; formerly known as Burma. The stones were delivered via armed courier in a package that, once selected and purchased, was waxed and sealed under the watchful eye of the purchaser, seller and customs officials. The valuable package was then shipped with not another person getting a peek until now. This all sounds very dramatic; and romantic and in actuality... it is. What little boy hasn’t imagined traveling off to far away countries, armed bodyguards at his sides, attempting terrain that only few have traveled in pursuit of one sole purpose... the acquiring of untold treasures. What little girl hasn’t dreamt of those very same things? Only, in addition to her dream, those same treasures are also being bestowed adoringly upon her. In the world of gemstones, geographically speaking, Burma, particularly Mogok, is thought of almost reverently. Mother nature has seen fit to bless this land with some of the most luscious rubies, richest sapphires and brilliant spinels that will stop a girl in her tracks... at least they have me! When I gaze upon these incredible creations of nature, I can’t help but remember that acquiring them didn’t come without a considerable degree of risk and back-breaking labor. At the American Gem Society (AGS) Conclave held this year in Phoenix, I had the pleasure of sharing dinner with Dr. Edward Gübelin and chatting about the differences between Burma, when he visited the enchanted land in the early 1960s and then more recently within the past five years. As he explained the complexities involved in reaching Mogok, his eyes lit up when he reminisced about the generosity and kindness he received whenever he visited. The Burmese culture is one of deep respect for the abundance that nature has bestowed upon their land. I detected that same respect in his eyes when he spoke of the hard work that those same people endured to recover the fine bounty, Time evaporated as he talked of how traveling to what is still considered the premier source of gem ruby and how it has remained virtually unchanged throughout the decades. Our talk reminded me that many months before that dinner, I had watched the video Dr. Gübelin compiled with his daughter, Marie-Helen, in 1962. The tape is titled Mogok  Valley of Rubies. In it he details an entire buying trip, from beginning to end, including how the mining is accomplished. There is rare footage from the I960s in which Burmese miners employ traditional methods, most of which are still used today. I so enjoyed watching the unusual, rarely seen methods of negotiation used between seller and purchaser. I was also pleasantly surprised to see that the majority of the daily dealing and decision-making was actually done by the women. After having watched this incredible film in all its splendor, I was given a much greater knowledge and appreciation for the beauty that I am so privileged to work with. But Dr. Gübelin, your genuine passion reaffirms the romance, and I dare say, no synthetic process will ever duplicate that. Special thanks to Dr. Edward Gübelin for his insightful commentary.